Play through volcanoes and mountain streams, avoid obstacles in logging sawmills, rise high up gondolas, creep through a cemetery, and advance through castle ramparts & gates. Navigate between boats, planes, a space shuttle or simply admire the detail and workmanship of the many scaled model themes. Thirst breakers are available on site and a quick walk gets you amongst the shops and café/restaurants of the Tannery opposite. Check you are booking the right location - this is Caddyshack in CHRISTCHURCH. During School and Public holidays, tee off times might on occasion get fairly busy but it does clear quickly. A simple phone call to check for any delays may be advised. Such a fun indoor activity for all the family! Had a great time with the family. The course was a real challenge with some great model work. The kids loved how the mechanics worked. Nikki was accomodating with helping us out. Good family fun! The manager very friendly and helped with giving my kids instructions. Excellent customer services. Really enjoyed ourselves, some of the holes were a bit of a challenge, which was good. 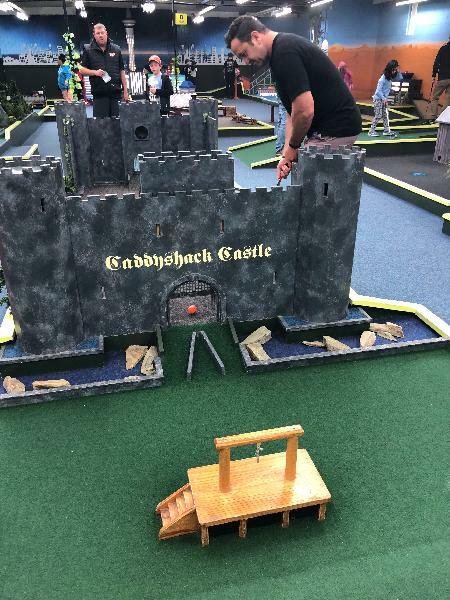 Your message has been sent to Mini Golf - CADDYSHACK CHRISTCHURCH - 18 indoor themed Holes - Ultimate Indoor Mini Golf Experience. You should hear from them shortly. Please note: all responses will come directly from Mini Golf - CADDYSHACK CHRISTCHURCH - 18 indoor themed Holes - Ultimate Indoor Mini Golf Experience, and not the team at Bookme.